Keep Baby Warm and Clean with a Few Cloth Diaper Baby Gear Items! Whether you're creating a Gift Registry, purchasing a gift for a new or expectant Momma, or just shopping for your own baby, you know that with babies come all the baby gear - especially when it comes to feeding, swaddling, and keeping them warm. Much of the baby gear is totally unnecessary, but some things certainly do make certain tasks easier for Mom and Dad and more comfortable for baby. Protect Baby's Legs with Baby Legs! From season to season, the Baby Legs by bumGenius! give protection and warm up baby's legs or arms as they lay or toddle about the house. Diaper Junction is the place to find all your cloth diaper needs. Our online store stocks most of the popular types of cloth diapers along with other baby gear. If you have never tried cloth diapers, Diaper Junction is the right place for you. We offer something most other stores do not. We will let you try any of our cloth diapers and return the baby products if you are not happy. This is great news for anyone who is unsure about using cloth diapers. Try cloth diapers for a period of 30 days. If you care about keeping our world green for the future of your baby, cloth diapers are something to become familiar. There are now new types of diapers that make using them more convient than ever. We offer pocket diapers, as well as conventional type diapers. We carry all of the latest brands of diaper covers with many types of closures. Our store makes comparing diapers easier than ever. Find all of your baby products in one place. We offer packages and kits in numerous sizes and styles. Our diaper reward program will also help you save money on diapers, baby clothing and hard to find baby gear. We also offer free shipping on orders of thirty five dollars or more. If you are on a budget you may enjoy the purchase of gently used diapers from our section of diapers used in our trial offer. These diapers are in great condition and have been sanitized for your babies safety. This is a great way to get started for anyone who needs to watch their spending. One of the best features you will find on our site is our educational sites about diapers. Combine this with our diaper blogs and you may find you are an expert on all aspects of diapers. We realize that you probably have a lot of questions about styles and proper use of these cloth diapers. Our education program will teach you all that you need to know about using and caring for your cloth diapers. Tell your friends and family about our site and get all of the baby clothing, diapers and specilized equipment you need for your little one. Browse our easy to use site and register for all of your favorites. 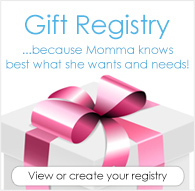 Your friends and family will love this easy way to shop for gifts. They will also enjoy giving a gift certificate for our cloth diapers or other hard to find baby products. Don't forget the cloth diapers - cover baby's bum in the comforts of cloth!